The antique dresser was really nice. 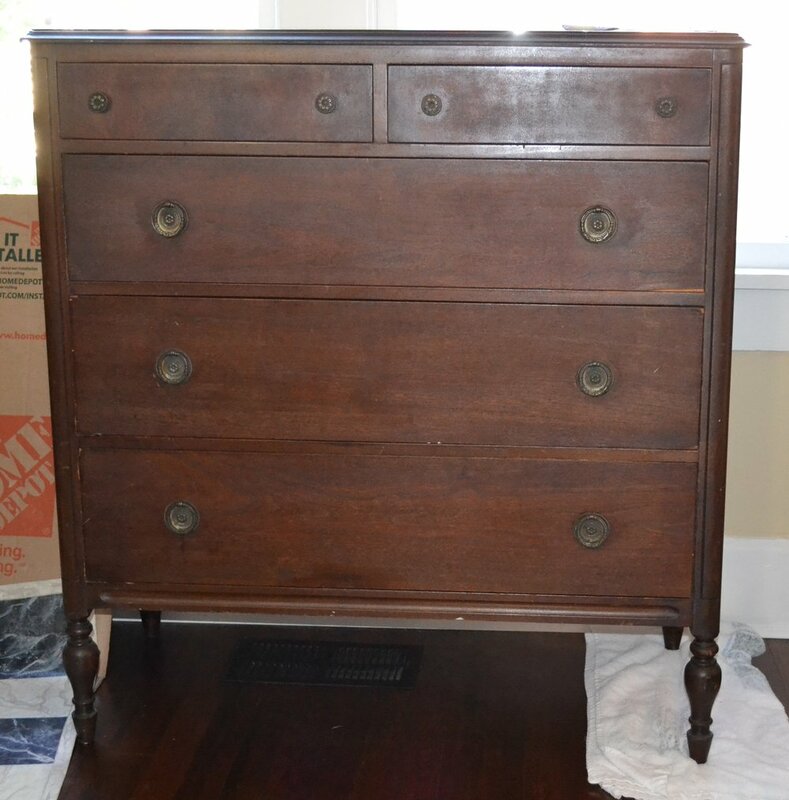 Very well constructed, with roomy drawers, interesting legs, and no repairs to be made. It was scratched and dull brown, as they generally are at that age when they've been well-used, with dirty, dull hardware. It had been listed for a while, so I made the seller an offer, and she agreed. I picked it up at a very small run-down house that contained, very surprisingly, many antiques. Gorgeous ones I definitely could never afford to purchase. But I would not have been able to paint those, anyway; I was happy with this one. I didn't think much of it when the seller fussed about how nice the pulls were, but when I took them off and cleaned them they had a wash of silver over the original brass and were actually acanthus garland wreaths. Each one was slightly different, so they were obviously hand cast. Way better than I had expected! So, since the hardware was now the star of the show, this piece needed an outfit to showcase the acanthus wreath jewelry. Milk paint was called upon--Miss Mustard Seed's Flow Blue, Ironstone, and some black--to make a sweet steel blue. Just the right amount of chippiness made the chest look classical and elegant, just like its rings. Follow my furniture adventures on facebook. There are some unique pieces in my Etsy shop!